With so many people finding out about pickleball and wanting to play the sport, it is apparent that having the right pickleball clothing is so important to enjoying this activity. 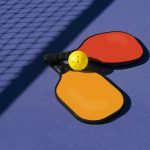 Pickleball combines strategy, dexterity, speed, and other skills that make it fun, challenging, and needing the right clothes to provide you the mobility to meet its challenges. For women, pickleball has become quite popular over tennis because it uses a smaller court, focuses on dexterity and agility, and they can successfully compete with men. However, to do all those things, wearing the right gear is important. 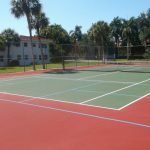 Naturally, you should think along the lines of exercise clothing along with gear that is appropriate for tennis when thinking about what to wear when playing pickleball. This means wearing items that breathe, are loose fitting, lightweight, and durable so they will last a long time. Sun Protection: One of the most overlooked aspects of clothing is protecting your skin from the sun. 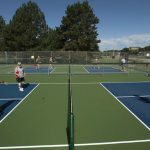 If you play pickleball outdoors, you will need to choose materials that offer protection from the ultraviolet (UV) rays that will damage the skin. This means wearing a hat or cap that fits well along with sunglasses so that exposure to your head and eyes are minimized. Also, think about wearing sunscreen that doesn’t run off when you sweat. Freedom of Movement: Clothing that provides freedom of movement means that you can move your arms and legs with full range of motion without restrictions. Because pickleball requires agility and dexterity, you will need to think about wearing items like a well-fitting t-shirt, tank top, or compression top that does not restrict the arms. A dress with a short skirt, shorts that fit well, or leggings are well suited to complete your outfit. Shoes: Because pickleball forces you to move around in a small area, getting shoes that provide enough flexibility and comfort are a must. You might want to think about cross-training shoes as they offer protection from side-to-side running and have plenty of padding. Also, think about high tops as they offer some protection for the ankles so you are less likely to have a sprain occur. Take a look at our article on the best pickleball shoes to wear. Because pickleball is a game of constant movement, you will be sweating after a short time. Consider taking breaks in your game and have plenty of water and towels at the ready. Wristbands and headbands will keep the sweat away from your hands and out of your eyes, so consider wearing those as well. If you are playing in hot or cold conditions, consider taking more breaks or shortening the game so that you do not dehydrate. Pickleball is a fun game that provides many hours of entertainment if you wear the right pickleball clothing and have plenty of water.